What is obsessive dog behavior? The obsessive dog behavior (also known as Obsessive Compulsive Disorder (OCD), Canine Compulsive Disorder (CCD), and Compulsive Behavior Disorder (CBD)), is meant to describe repetitive, exaggerated, sustained, often self-destructive types of behavior in dogs. 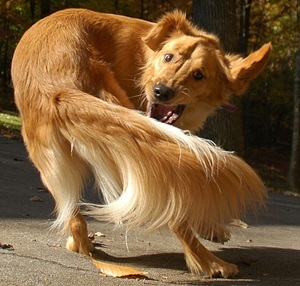 The most common examples of OCDs are spinning, tail chasing, fly snapping, shadow chasing, flank sucking, air licking, and continuous barking. These OCDs are never fun either for the dog or for its owners. Those who find them funny should realize it's the same as laughing at someone who's falling into addiction for alcohol or drugs. Dogs with OCDs can end up hurting themselves because they have no control of what's going on. When a dog becomes obsessive, you can usually tell it by its body language. The dog's body will stiffen, the eyes will become fixated up to the point when there's nothing able to distract the dog. It's nearly a trance with no place for relaxation, joy, and play. It is not a fun condition to be in. There is no single reason that causes OCDs. It's usually a number of reasons, and some of them can be more obvious than others. A lack of regular physical and mental exercise, living in a stressful environment, frustration, a lack of human leadership, anxiety, and pain can all result in OCDs. It's said some breeds like Terriers, Border Collies, Aussies, Golden Retrievers, Rottweilers etc tend to develop obsessive behavior more often than others. This is probably due to the fact they were bred for a purpose - for work. Fulfilling a task is in their blood. They need to keep their keen minds busy with something. When an owner fails to provide them with a task, they find a "task" themselves, which often result in one or several types of obsessive compulsive behavior. These dogs are left with no choice. Preventing OCDs is always easier than dealing with severe consequences of compulsive behavior. We recommend that you follow the tips below before you start having problems with OCDs in your dog, but they can also be applied when a problem has developed. - Never reinforce obsessive compulsive behavior! It may look a little funny when a dog starts chasing its tail, but if you laugh instead of taking it seriously and correcting it as early as possible, you'll reinforce the unwanted behavior. Your dog will definitely not feel happy when its obsession escalates to something it can't control. If you can't help smiling or laughing, just leave the room. - Correct obsessive behavior immediately. Learn the signs that your dog is getting into an obsessive state and interrupt the process before your dog gets absorbed by it completely. Distract the dog with another task before it's impossible to redirect his or her attention. Use leash correction as appropriate. - With obsessions like paw and flank licking (self-hurting behavior), make sure there's no underlying medical reason that makes your dog be in pain. - Increase the amount of exercise and mental stimulation you give your dog. Besides the direct effect of draining the animal's suppressed energy, exercise promotes endorphin release. Endorphin has a calming effect. - Train your dog. Teach your companion the "leave it" command. Training helps you both understand each other in a better way. When a dog knows what you want from him or her, it feels more relaxed. This reduces the amount of stress caused by improper communication. - Never use yelling, hitting, or other physical punishment! They always do more harm than good, if there's any good in them at all (obviously not because these methods verge on animal abuse). They cause stress, fear, humiliation, and anxiety, which are known to contribute to OCDs. When you need to show a dog it has done something wrong, use a spray bottle with clear water, ignore the dog for a while, give it no treats and so on. There are plenty of non-violent and more effective methods to let a dog know you're not happy with it. - Play "Through a Dog's Ear" CDs. They have been clinically demonstrated to reduce canine heart rates. - Feed your dog a high quality diet (grain free or raw). - Constantly work on reinforcing your pack leader role. A dog without proper human leadership is left without proper pack hierarchy that dogs are used to in the wild. As a result, they are likely to develop various behavior problems incluing OCDs. If nothing of the above helps, or your dog's OCD leads to aggression and you're afraid to deal with it, seek professional help.